Think your bathroom needs an extreme makeover? Well, you’ve picked a good year as trends in 2018 are shifting to include more new technology. If your concept of new technology is both hot and cold running water in the same place, then you are in serious need of an upgrade. Let’s take a look at some of the new bathroom trends for 2018. We’ve all heard this, or a variation on this but when it comes to bathrooms, small is becoming a real focal point. You can thank (or blame) the movement towards smaller (translation: tiny) houses as the reason for this. So, instead of having a huge luxury bathroom that can easily accommodate half the family all at once, think of something that would fall under the category of space saving. It’s true. 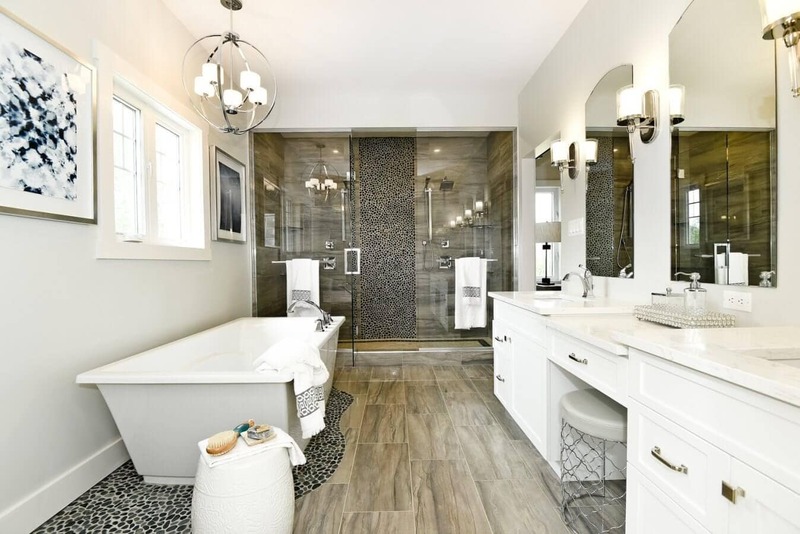 The new bathroom trend is for smaller ones without tubs and narrow spaces that create a more visually appealing look. In other words, less function, more looks. Here’s the fun part of a tiny new bathroom – it’s the gadgets. Expect to see mirrors with touchscreen capabilities so you can adjust lighting, temperature, and other functions. Watch for showers that have voice-activated controls where you can control water temperature, music and more. There are also motion-activated faucets, hand dryers that are energy efficient, heating systems built into the floor…there are so many new possibilities to turn your bathroom into a high-tech space. Flow control in shower heads and smart water heaters save on energy and are good for the environment. As a result, they both fit right into new trends for bathrooms in 2018. Plus, LED lighting, energy efficient exhaust fans and easy to control temperature settings keep costs down and keep your bathroom on the cutting edge of today’s eco-friendly world movement. Black is back. Or should we borrow from AC/DC and say that bathrooms are back in black? Well, your kitchen isn’t the only room that rocks in black. Bathrooms are getting the same treatment these days. Oh, and the combo of grey and beige (known by professionals as "geige") is considered rich, and neutral which seems to work in both warm and cool color schemes. Essentially what you are seeing is colors that were once used as accents are now coming out as feature colors. Remember when you changed out all your bathroom fixtures and went with brass for a new look? Well, the new trend in bathrooms in 2018 is moving from brass to gold. We’re talking gold-color here, not the precious metal. These treatments are perfect to add to custom homes for sale or to just spruce up your current living space. If you are looking for the best home builder in Ottawa, give us a call. We can provide you with top quality home renovations or build a custom home from the ground up. For more information call us today at 1 (613) 489-3838.